Halloween is just around the corner, so it's the perfect time to start thinking about decorations, costumes and, of course, food. 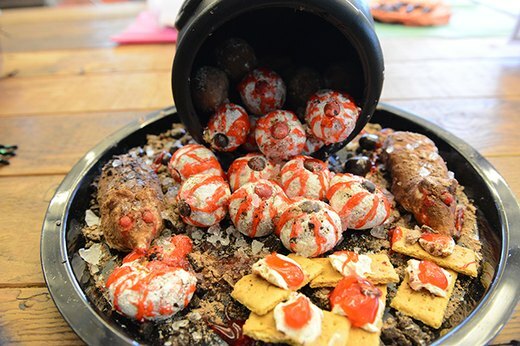 This year, impress your guests with disgustingly easy recipes to get into the Halloween spirit. 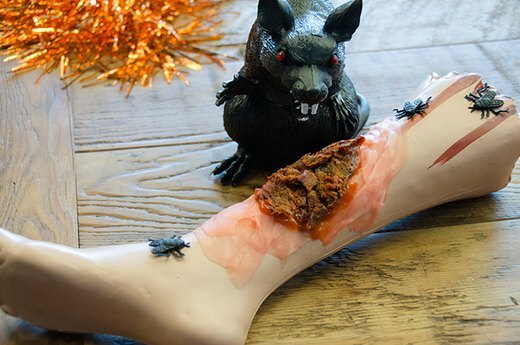 Don't worry, these tricks and treats are just as tasty as they are disturbing! Who says healthy can't be scary? 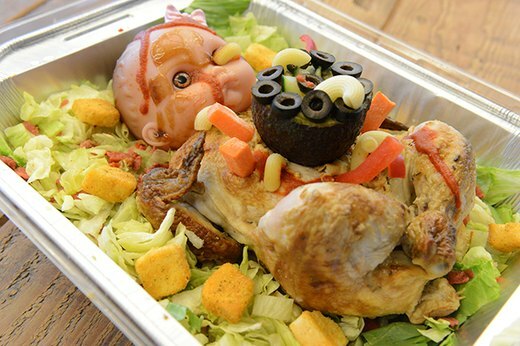 This Halloween, shock your dinner guests with this creepy take on a chicken salad. Take a full, cooked chicken and place it on a bed of your favorite lettuce blend. Dress up the chicken with veggies, a stuffed avocado and macaroni that looks like maggots. Last but not least, add a clean doll's head to the top of the chicken and cover with your favorite hot sauce. 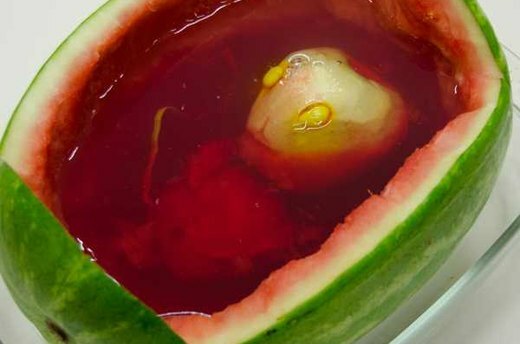 This bloody baby makes the creepiest salad you've ever tried to eat. 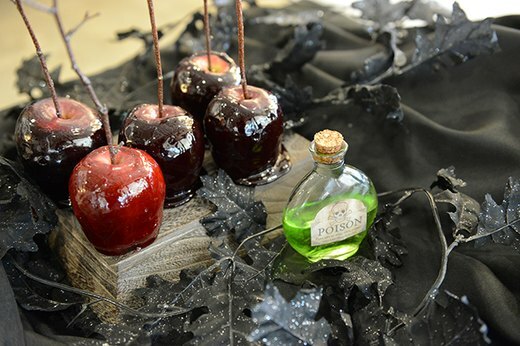 Play wicked witch and whip up your own batch of poison apples. This classic treat can be made by bringing 3 cups of sugar, 1 cup water, 1/2 cup light corn syrup to a boil and cook until it reaches 290 degrees (using a candy thermometer). Stir in 1/2 tsp cinnamon extract and 1/8 tsp black food coloring and dip the apples in one at a time. All the little kiddies are sure to enjoy their fruit this year... muahaha! 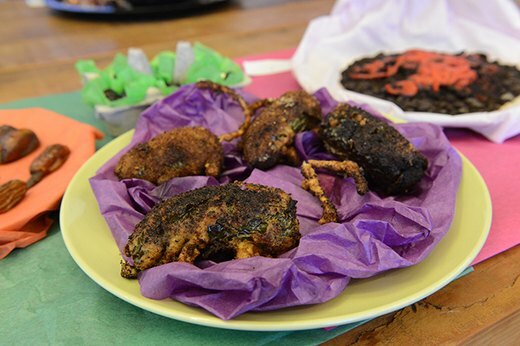 Impress your thrill-seeking friends with this "Fear Factor" inspired snack. 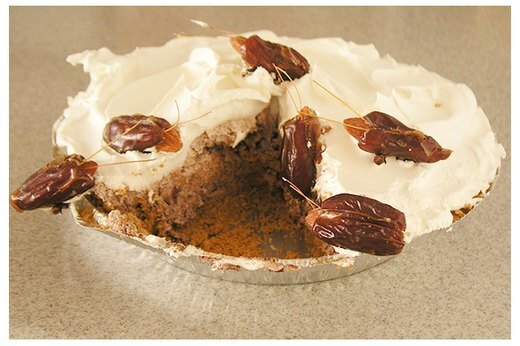 Using pitted dates as the shell, fill each "cockroach" with sweet almonds and arrange them atop of an alluring chocolate cream pie. Watch onlookers cringe as the brave few chow down on a delicious roach covered pie. Beef jerky is delicious. It also makes great looking scabs. To create this totally unnerving scene, take some made-for-sushi ginger and place it on a plastic limb as the outer, slightly raw flesh around what's about to be a large, infected wound. Take strawberry jam (or hot sauce) and use it as glue for the jerky. Be generous, as the oozing out "blood" gives it a dramatic effect. The plastic rat and flies chowing down were the only takers at our party. Take your guests for a flavorful loop with these deceivingly delicious cupcakes. Make a batch of vanilla cupcakes and scoop out a hole from the top. Fill the hole with a dollop of strawberry filling. Then, turn your traditional buttercream into a brain-colored gray by adding some black food coloring. Make a rounded dome with the first layer of buttercream and use a piping tip to make the squiggly brain details. Watch tasters squeal as they bite into a sweet, bloody center! Intestines for dessert? Only on Halloween! Don't be surprised if this treat makes your dinner guests cringe. To make this disgusting delicacy, roll out dough and add chocolate pudding and chocolate chips to the center. Fold the dough so the chocolate is tucked inside and bake for 14 to 16 minutes. To add the fresh-from-the-flesh look, smear some strawberry rhubarb on top and dig in! 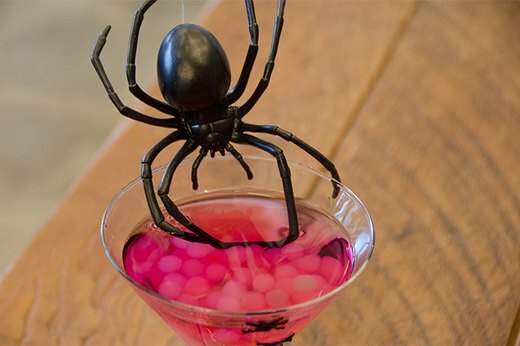 Take everyone's favorite tapioca balls and transform them into ready-to-burst spider eggs. Settle them at the bottom of a martini glass and mix up your favorite cocktail (mockatils work, too!). You'll never see anyone drink a drink so carefully, so as not to disturb the spiders. Scare the life out of anyone trying to take a bite out of your pumpkin pie. To make this unearthly recipe, knead dough into the shape of a face and bake the bread until it's golden brown. Add texture to the face by adding cracks and bumps while it's still warm enough to mold. From there, place the face in the center of your mushed up pumpkin pie. 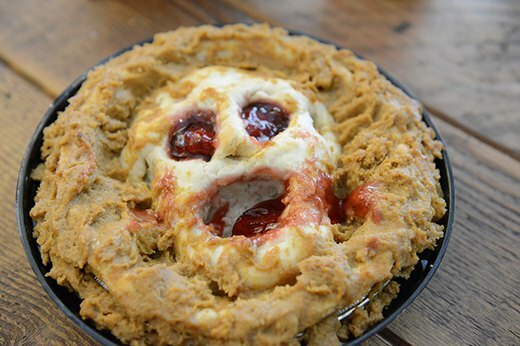 Fill in the empty spaces on the face with pumpkin filling so it looks like it's coming up from the pits of hell, through the pie, and directly at your hungry guests! Fill in the eye sockets and mouth with strawberry jam to complete the creepy silhouette. 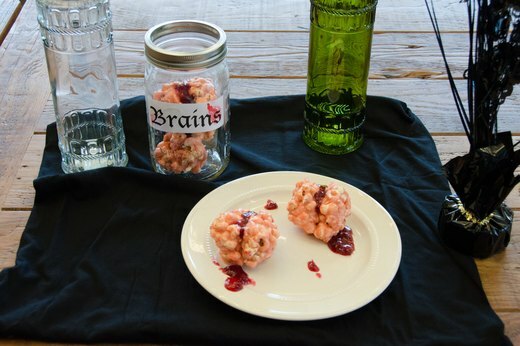 Zombie hipsters will love this Mason jar treat! 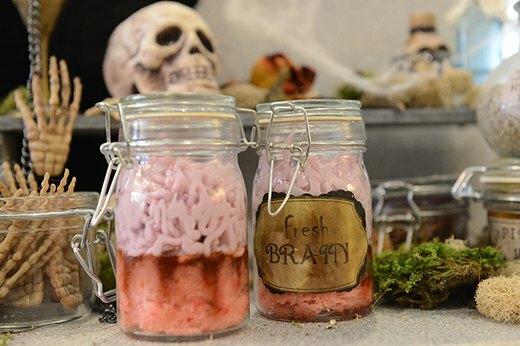 To make these brain cupcakes in a jar, use strawberry cake rounds, seedless strawberry jam and buttercream frosting. This dessert is sure to be a hit for walkers and mortals alike. As much as we enjoy a good ol' American hot dog, we have to admit: They make great fingers for Halloween platters. 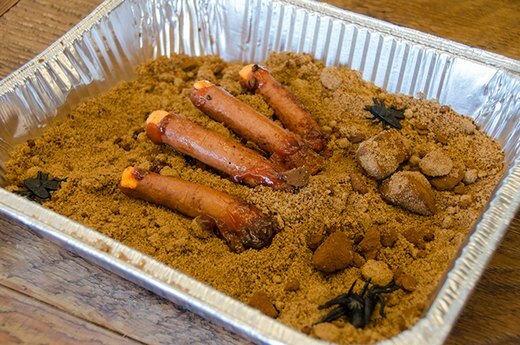 Place the cooked hot dogs on a bed of brown sugar and cocoa powder, digging in the base so it looks like the fingers are clawing their way out of the dirt. You can use a variety of foods for nails, like onions, almond slivers or orange or yellow taffy candy. The kids are sure to get a kick out of this sandbox surprise! 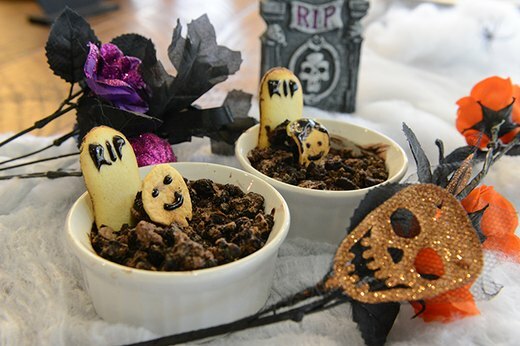 Whip up a deathly adorable scene with these simple-to-make gravesite pudding cups. Use chocolate pudding and crushed chocolate cookies to make the dirt. Make a tombstone by icing a cookie and placing it in the dirt. As for the heads, give them a wrinkly texture by drying the apple slices in the oven. Make two or make twenty! Make sure you keep the couples together -- 'til death to they part! Nothing would make your mother scream louder than seeing a rat anywhere in the house, especially on the dinner table! Craft this rotting wasteland by molding mice out of cream cheese and sweetened cocoa powder. 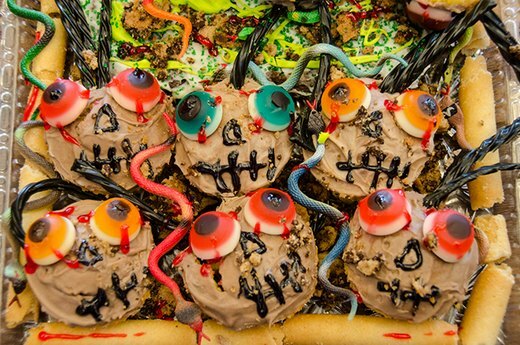 Arrange the mice onto a platter of eye balls made with doughnut holes, Band-Aids made from graham crackers, and other "trashy" foods. We can hear the shrieks from here! Staying in for a night of scary movies? That means popcorn, and what better way to enjoy nomming on this staple movie night snack than making it in the shape of brains? Melt 1.5 ounces of butter, browning it just a little. Then add in 3.5 ounces of white chocolate and 7 ounces of marshmallows until they melt together. Add 1 teaspoon of vanilla extract and a few drops of red food coloring before adding in the popped popcorn. Mold two halves of the brain and push them together with a layer of raspberry jam in the middle. The thicker the jam, the better! Every party can benefit from a delicious seven-layer dip. Add a Halloween spin to yours by making your guests get to the dip through baked barbecue ribs. As ribs do, they are protecting the vital essentials within, so getting through won't be an easy, clean task! Adding a melon head is great for context, but that won't stop your hungry guests from prying away at the bones like animals. There's nothing gross about guacamole, right? Even if it's coming from a large, green rice crispy nose? Disgust your guests with this sneezy appetizer. Mold a basic crispy rice treat into a nose and place it over a bowl of guacamole and salsa to create a sickening scene. Step up the ick-factor by adding in untrimmed nose hairs -- a.k.a pieces of dried and burnt ramen noodles to the snot colored dip. 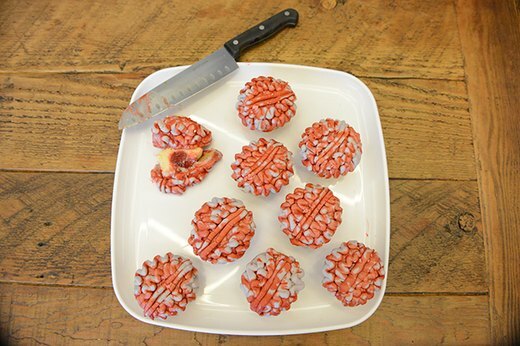 If grotesque foods isn't your thing, you can go for totally weird with these shrunken head cupcakes. Bake your favorite vanilla cupcakes decorate them with eyeball candies, licorice and gel icing. The gooey filling on the inside (a mix of frosting, strawberry preserves and red food coloring) will have unsuspecting guests shrieking! Trying to maintain your ghoulish figure? Or maybe you're too dead tired to bake? 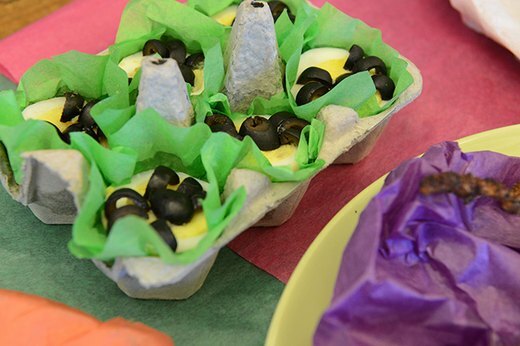 Make this crawly (and healthy) appetizer using hard-boiled eggs and canned olives. Add some hot sauce for an extra touch of creep. Lychee, a tropical Chinese fruit, has the perfect consistency, shape and color for tasty dessert eyeballs. Fill them with your favorite red jam and plop in a blueberry for a totally realistic eye. Special Note: In order to get the vein-y look, smear a little of the jam around the outside of the lychee. You won't be able to get the sight out of your head! Poison and deathly concoctions are romanticized for a reason. Make this not-so-lethal liquid with 2 cups ice, 1 ounce vodka, 1 ounce gin, 1 ounce white rum, 1 ounce white tequila, 1/2 ounce grenadine and 1/2 of cola for a deadly affair. Add dry ice for a truly eerie, romantic sight. No one wants to eat worms, right? Wrong. 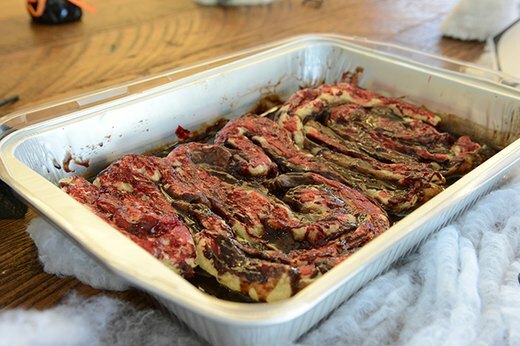 Make this crawly dessert using red-colored gelatin mixed with water and heavy cream. Fill bendy straws with the mixture and let the gelatin set in the straw. Once they've cooled and hardened, run the straws under warm water and gently squeeze the worms onto a plate of crumbled chocolate cookies. Grab a tray of brownies and cover them with chocolate graham crackers and green-dyed coconut shavings to create the dirt and grass of your graveyard. Decorate the scene with white chocolate covered gravestones, also known as marshmallow pumpkins. Thread yogurt-covered pretzels onto a skewer and top it with a marshmallow head to create a skeleton. 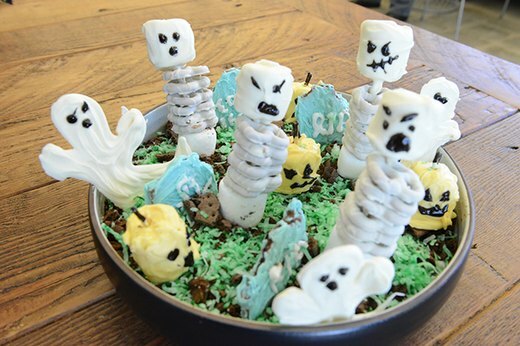 Use icing to add some spooky faces and you've got your very own graveyard party! 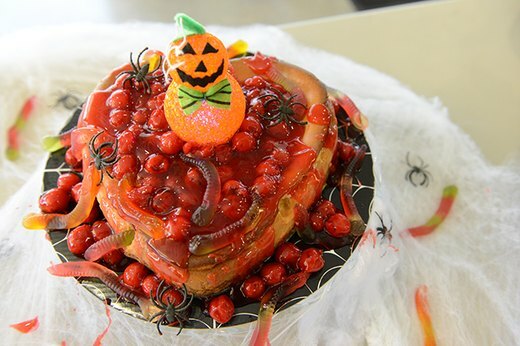 There's nothing rotten about a cheesecake, even if it is topped with gummy worms and chocolate spiders. To make this fall favorite, simply bake your favorite cheesecake in a heart-shaped pan and decorate it using gummy critters. Add cherry pie filling on top for an even creepier effect. 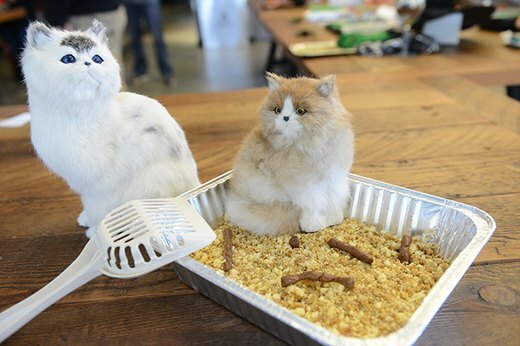 You're going to need a strong stomach and a wicked sense of humor for this cake that looks a bit too much like a real litter box. Simply crumble up cake donuts to look like a cat litter box and twist tootsie rolls to resemble... well, you know. Cat lovers, beware! If it looks like a rat... it might be a jalapeño! These deep-fried critters are nothing more than fried, pretzel-stuffed jalapeños. Add details like a tail with cooked spaghetti. Carefully place the breaded and prepared jalapeños into a heated oiled pot until they crisp to your satisfaction. The resemblance is uncanny, yet completely vegetarian-friendly! If you believe the saying "you are what you eat," grab a plate and pile it up with some brain. 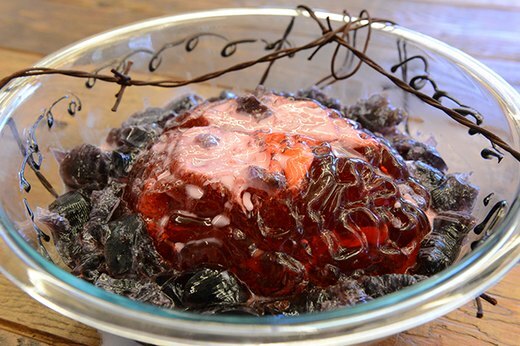 Pour your favorite red gelatin flavor into a gelatin mold in the shape of a brain (these are sold in most Halloween stores) and let it cool for at least 4 hours. 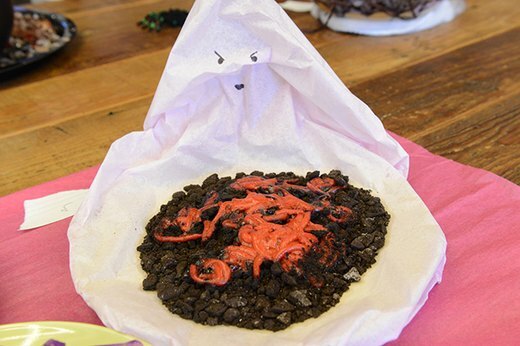 This classic Halloween dessert is quick, easy and sure to impress. It doesn't matter how old we get, the sight of used band-aids will always make us cringe. That's why this dish is perfect for your Halloween party. 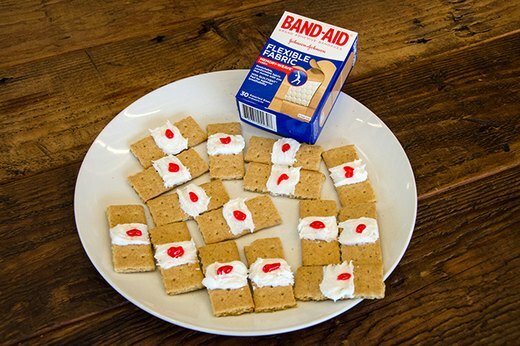 All it takes is some graham crackers, cream cheese and red gel icing to gross out everyone who sees it. Satisfy your sweet tooth while channeling your inner nerd with these decorated cupcakes. 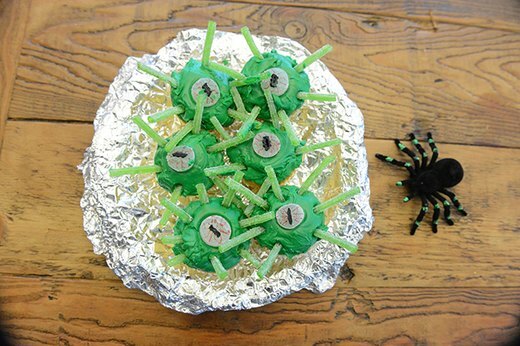 Mix-and-match your favorite frosting, dyes, and candy to make a variety of edible aliens. This makes a perfect Halloween craft for the kids. Running low on time? You don't even have to bake these yourself. Buy your favorite chunky chocolate chip cookies and some black gel icing and start decorating. 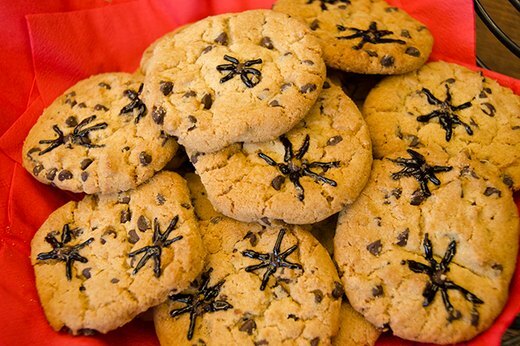 Use the largest chocolate chips on each cookie as the spider's body and draw some legs around it. Party-goer's who aren't paying attention will be in for a spooky surprise. Time constraints are no excuse for not getting into the Halloween spirit! 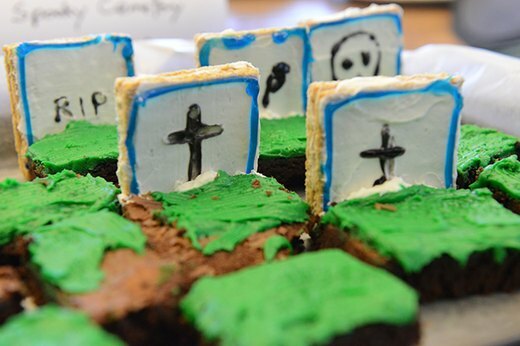 Brownie squares can be decorated with frosting and cookie tombstones for a quick and scary touch-up. If you're taking these to a party, get creative with the names on the tombstones. 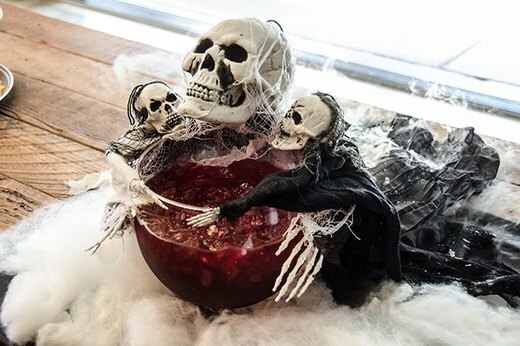 Your friends are sure to get a kick while enjoying this deadly delicious treat.